Following the capture of Gilad Shalid in June 2006, Israel collectively punished Palestinian political prisoners from Gaza by banning family visits, one of their basic rights and a lifeline between detainees and their families. “Under international humanitarian law, Israeli authorities have an obligation to allow the detainees to receive family visits,” said Juan Pedro Schaerer, the head of the ICRC delegation in Israel and the occupied territories. Our detainees’ determination proved stronger than the jailers’ guns. In exchange for ending the one-month mass hunger strike in May, they made Israel comply with the international humanitarian law and reinstate family visits to Gaza Strip detainees after almost six years without them. On July 16, 48 family members were finally allowed to see to their relatives in Israeli jails for the first time since Shalit’s capture, through barriers for 45 minutes. However, Israel imposed its own conditions on the visits. Only wives and parents were allowed to visit. Detainees’ young children weren’t, “for security reasons.” Fathers must imagine their children growing up without them, or wait for the miracles of their smuggled pictures. Last Monday, August 6, the fourth group of detainees’ families gathered in front of the ICRC to visit their relatives in Nafha prison. The day before a visit, the ICRC usually announces the names of approved relatives. Among those who received permits were the parents of detainee Yahya Islaih, who was captured on August 24, 2008 and sentenced to 12 years. His 75-year-old mother and 80-year-old father arrived very early at the ICRC, dressed very traditionally and beautifully. Yahya has not met his parents since his arrest. I used to see Yahya’s mother Aisha in the sit-in tents for political prisoners. She barely missed any protest, despite her advanced age. Last Monday was supposed to be her first reunion with her son in four years. But destiny stood between them. Aisha breathed prayers of thankfulness that she had been blessed with another opportunity to talk to her son, and see him through a barrier after five years of separation. While sitting in the bus, wishing that time would move faster, she felt the gasp of death and leaned on a neighboring woman’s shoulder. Later that morning, as I was getting ready to leave for the weekly protest for political prisoners, I read the terrible news. I found it difficult to believe that this had really happened. I thought that we only hear such stories on dramas. But it did happen. When she was so close to meeting her son again, she passed away. Death separated them, just as Israel had for so long. The world blamed her when she hurled her shoes at Ban Ki-moon’s convoy when he entered Gaza. She was angry and disappointed by his prejudice when he refused to meet prisoners’ families in Gaza, after repeatedly visiting Gilaad Shalit’s parents. But they didn’t know to how much she had suffered at Israel’s hands. Read the story of this incident, when shoes and stones welcomed Ban Ki-moon to Gaza, here. After the protest, I went to say hello to her. “Are you joining us for the funeral, Shahd?” she asked, every wrinkle in her face revealing her sadness. “Yes, grandmother,” I answered, even though I hadn’t known of the plan. I wasn’t sure whether I wanted to go or not. Honestly, I fear funerals. But when I said yes, she caught my hand so I could help her to the bus, and pushed me forward as if she sensed my hesitance. “When I saw her last Monday, she congratulated me for having visited my son, and sighed while hoping that her turn to see hers again would come soon,” Om Mahmoud said. When we arrived at the funeral, we learned that Aisha hadn’t been buried yet. She was in a narrow room with two doors. It was crowded with women. They entered one by one from a door, kissed her, prayed for her, and then left through another door. I glanced at the scene, then pushed myself away, trying to postpone my turn. I recalled meeting my dear friend Vittorio Arrigoni for the last time as a dead body. Finally my turn came. I entered, one foot pushing me forward, the other backward. I saw her body and kissed her forehead. I still can’t believe I did. Traumatized, I returned home in the afternoon and slept. I couldn’t stand thinking of her, nor her son, who would never see his mother, alive or dead again. I felt like I wanted to sleep forever, but I woke up after twelve hours. 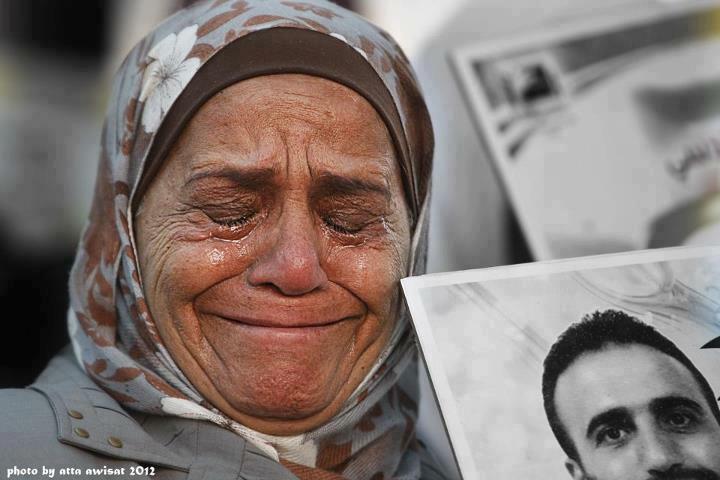 Please pray for Aisha’s soul to rest in peace, and for her son to remain strong behind Israel’s bars. Her story is more clear and bitter evidence of the suffering our detainee’s families endure because of Israel’s violations of their basic rights and their families’. This entry was posted on August 8, 2012 by Shahd Abusalama. It was filed under Palestinian Political Prisoners and was tagged with Gaza siege, Hunger Strike, Israel, Israeli Occupation, Israeli Prison Service Israel The Gaza Strip Nafha prison Gilaad Shalit prisoners exchange hunger strike Palestinian political prisoners Gaza siege Aisha Isleih Yahya Isleih ICRC International Committ, Nafha Prison, Palestine, Palestinian Political Prisoners, Palestinian prisoners, Swap deal, Vittorio Arrigoni. Thanks Adham :) May her soul rests in peace! When the Zionists are held to account for their heinous crimes, as they surely will be one day, I hope that the world shows their families the compassion that the Zionists have denied to others. I hope that the day when The Zionists are held to account come soon! Every criminal who contributed anyhow to our suffering must be sued. Justice have to be practiced, not to be just a slogan people say in their speeches! But yes, I don’t wish any family to go through what our detainees’ families go through from humiliation and strip search and more through their apartheid checkpoints. This story left me speechless and Aisha is just one story of thousands of stories for palestinian mothers and families who suffer each day they wake up to find their kids missed but we inside know this situation how matters lasts, we will end it up someday because Aisha didn’t go down and we won’t too… am proud bcz we have young writers such you Shahd who makes our voices heard and our case followed.